Chalk and seashells are made of the same thing: calcium carbonate. Shells are stronger because they have trapped proteins inside, and scientist had thought that these proteins were trapped like flies in amber. It turns out it’s way more organized than that. Scientists know that it’s the little proteins trapped inside that makes the difference between crumbling chalk and rock-like shell. These proteins are squished down, like compressed springs. That seems like it would make the calcium carbonate more fragile, but it actually creates a compressive force that strengthens the material. How the proteins got trapped inside calcium carbonate was a matter for debate—until now. A group of scientists doing a study on calcium carbonate at Lawrence Berkeley National Laboratory released their results in Nature Communications today. The little structures straining against the calcium carbonate are called micelles. Micelles can look like little tadpoles, with a head and a tail, but their head is hydrophilic and their tail is hydrophobic. Put them in water and they form little round bundles, tails inward and hydrophilic heads outwards. The going theory was that they landed randomly on forming calcium carbonate and it grew fast enough that the micelles didn’t move. They were like flies trapped in flowing amber. The researchers used atomic force microscopy and they found it wasn’t like that. Calcium carbonate grows into formations that look like a huge, wide series of steps. When the micelles land on the growing shell, they stick to only the very edge of the steps—the sharpness of the edge allows them to bond with the material. The calcium carbonate then grows up around the micelles—even making little cavities in itself to accommodate them. The cavities aren’t quite wide enough, though. As the calcium carbonate grows around them, it compresses their sides. This compression leaves the micelles straining outwards, putting pressure on the calcium carbonate and hardening it. This represents a significant change from how researchers had assumed these materials formed. Instead of a quick sloppy process, it’s a precise one that depends on the chemical interaction between the calcium carbonate steps and the micelles. Researchers hope that they can use this knowledge to help them build their own ultra-hard materials made from two different substance interacting on nanoscale. 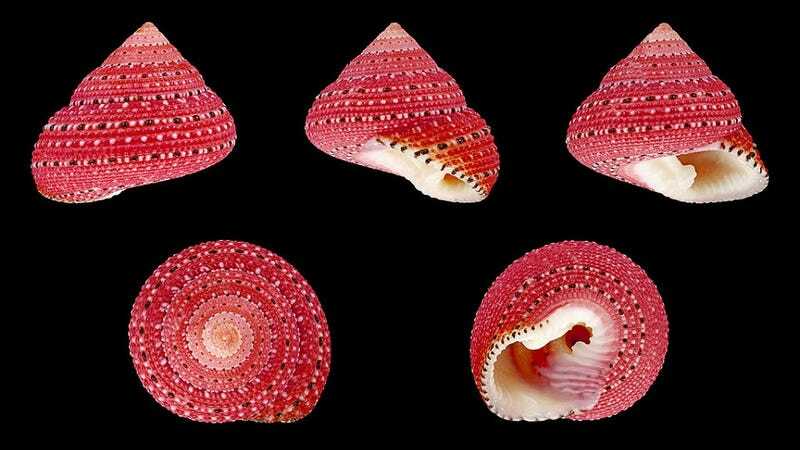 Shell Image: H. Zell. Micelle Image: Wiki Commons. Micelle Compression Images and Micro Images: Nature Communications.